First National Bank and Trust Company in Clinton made a recent donation of $2,500 to The Neighborhood Care Center, which serves as a hub for several ministries that help local families in the community. Various offerings include neighborhood market, crisis relief ministry, and clothing room ministry referrals. 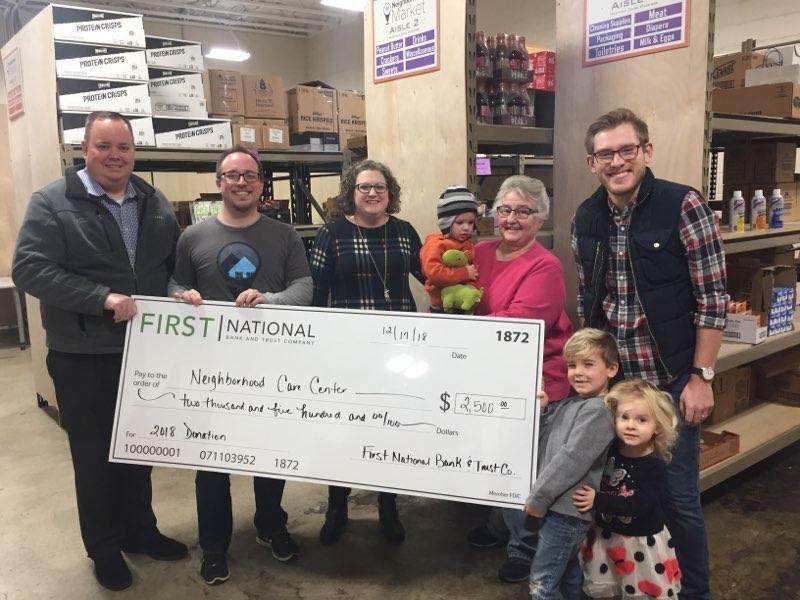 First National Bank is a proud supporter of the neighborhood market which includes the mobile food pantry, holiday baskets, and backpack programs. The care center opens to the public every Tuesday and Thursday at 12:30 p.m. to 3 p.m. Donations and deliveries can be made on Tuesdays and Thursdays between 9 a.m. – 12 p.m. To learn more visit www.clintonfcc.com/carecenter or call (217) 935-3139.